Classic-Castle.com • View topic - LCC-Loreos Official Faction Thread. From the arid desert in the west to the grassland in the east, Loreos dominates most of central Roawia. The proud and traditional Loreesi are unrivaled in their ability to harness the power of horses, a tradition passed on and honed to perfection through generations. Due to the harsh conditions and flat land, castles in Loreos are mostly larger constructions of sandstone and mortar. Creations in this faction should be inspired by real world old Middle East and Southern Europe. The people of Loreos are the most united faction in the lands of Roawia. The duty of leading this arid province has fallen to Jarius Lorean, The Prince of the Desert. He leads by maintaining the love and respect of his men, who would do anything for the heir of Lorean. But he is a leader in his own right, vigilantly defending the borders of Loreos from all who dare to oppose it. His loyalty to the King is great, though others may scorn the King for his less-than-colorful reign. The Prince would do any deed, no matter the difficulty, for the King’s honor, but more importantly, for the glory of Loreos. - Demonym : Loreesi (plural: Loreesi). - Building style/materials: Large castles, sandstone. - Natural resources: Fertile land (some areas). - Economy: Livestock, horses, agriculture. - Navy: Medium sized ships. 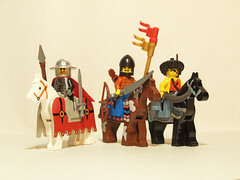 - LEGO sigils: Crusaders, Kingdoms Lions. See below in the FL's post. PM Bentoft if you would like something added. New members: Please sign up and complete the CIC. GARHEIM WON THE FIRST GLOBAL CHALLENGE. Great job guys!! We did good! LOREOS WON THE SECOND GLOBAL CHALLENGE. LENFALD WON THE THIRD GLOBAL CHALLENGE. We did pretty good guys, Let's smush em next time! We have a Loreesi Flickr group. LCC-Loreos. feel free to ask for an invite. I think I got most everyone, but please let me know if I left anyone out. Heading to War. By Thomas Arrowford. LC1~The First Loreesi Jousting Competition Winner... Robin Longstride. LC2~The Loreesi Settlement Building challenge Winner... Pedro Ivo's Stable of Salus. LC3~Defend the Homeland Winner... LWC guy's Attack on Bardurk. LC4~Trade with Lenfald Winner... Thomas Arrowford's The Exchange. LC5~The Second Loreesi Jousting Competition Winner...Jonathan Birchbrush. LC6~The Loreesi Shipbuilding challenge Winner... Thomas Arrowford. LC7~Thirst Winner... Mark of Falworth. FOR THE GLORY OF LOREOS!!! Last edited by Mark of Falworth on Tue Apr 16, 2013 5:57 pm, edited 21 times in total. Re: LCC-Loreos Official Faction Thread. I'm your friendly neighbourhood Faction Liaison. I take this first comment slot to welcome you here, Welcome, and to make sure you all know what's expected. As a citizen of Loreos, we expect you, to take part in contests (at your convenience ) and to stay active and do your best to serve our noble faction. Stay proud, stay loyal, and gain glory!! But don't let these rules be constrictive, use them to your advantage and to further our glory. Remember please post your entries to the entrance contest, thank you. Last edited by Hayden. on Sun Feb 02, 2014 10:15 pm, edited 71 times in total. Sir Mencot of knights of Justice sits down to the round table of the knights of Loreos. Awaiting and ready for your command, master . Last edited by mencot on Wed May 15, 2013 6:39 pm, edited 18 times in total. I can't wait for the first contest! It will be a Inter faction one, probable just for fun or to find out who's the best Loreesi so far, ether way I hope it won't be to far in the future. I look forward to the next challenge. BTW: will there be a winner of the CIC? Even though it is never ending challenge. Is Prince Jarius Lorean Marks new character? What happened to Mark of Falworth? Lorean was also the name of the original founder of Loreos, and thats a bit confusing. BTW: Maybe the Lore should be placed in the intro / FAQ thread. How about province maps? Should we make a special Loreos map, so we could start talking about where on the map our characters live? Last edited by Bentoft on Tue Feb 19, 2013 1:12 pm, edited 4 times in total. -I believe that LCC is just a forever going contest, and there willl never be a winner.If there is one though, It will be us! -The character is just the ruler of Loreos, and heir to it, while he is descended from Lorean he is not him. Mark's in-game character will be Mark of Falworth, this was really just to tell you who your (in-game) leader is. -Finally, Province maps, I'm okay with you making one for you province/ fiefdom/ lands but I'm not sure, Wait for Mark to reply, to get a definite answer. 1) Im workking on my CIC and I would like to know if there's a some restriction with the foliage? I know Loreos is in a desert, but we also have some green areas, right? 2) Can I make a few light cavalry as scouts? It wont be "out"of our style, right? Last edited by Pedro Ivo on Mon Apr 16, 2012 3:20 pm, edited 1 time in total. You can have foliage, because while we are based in the desert we do have, oasis's, grassland and if you look on the map, we have a river, like the Nile, surrounded by greenness! So as long as it is'nt forest or woods or snow, and near some kind of water, even if its just mentioned, you can have as much as you like. And the don't have to be these types, you can use horses, elephants or pigs! if you really wanted to. And I can't wait to see your CIC entry! I have finally completed my CIC! Not sure how much time I will have for LCC, but I will try my best to contribute where possible. I went for a slightly different approach - more of a nomadic horse tribe. Don't worry though, I won't be building anything too strange! Hope this is acceptable for part of the Loreesi faction, if not let me know! I think it's a very cool adaptation! it would make Roawia much more realistic to have some nomadic tribes. I also like the fact that the current leader is trying to modernize his nomad followers. A very realistic touch IMO. so that his brave knights may hone their skills to further perfection. Entrant knights will be paired by the FO and FL. The knights will joust each other one on one. The knights will be eliminated until one victorious knight remains! Loreos members and CIC approved members only. You must submit you entry(ies) Before the 3/15/2012. That you entrant be made of LEGO. Your knight must be mounted (Any animal will do). He must have a lance and shield. Brickforge, Brickarms, and Brickwarriors part are acceptable. No megablocks or other type bricks. 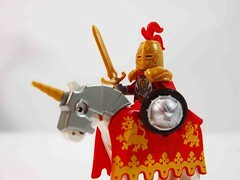 No more than 1 Image per entrant knight. Sir Bragallot's 2nd: Lothar "the Scorpion"
don't forget to PM Hayden With your jousting info. Last edited by Mark of Falworth on Tue Mar 13, 2012 6:07 pm, edited 7 times in total. Yeah, Marks pretty much covered the basics, but I also like the felt and fabric tents, a very nice idea! They seem a lot like the Mongola to me, and its always good to have a few mongols on your side! No more than 1 Images per entrant knight. Nice! So, I just have to show the knights or do I have to create a background scenario?